"99 Luftballons" (German: Neunundneunzig Luftballons, "99 balloons") is a song by the German band Nena from their 1983 self-titled album. An English-language version titled "99 Red Balloons", with lyrics by Kevin McAlea, was also released on the album 99 Luftballons in 1984 after widespread success of the original in Europe and Japan. The English version is not a direct translation of the German original and contains lyrics with a somewhat different meaning. While at a June 1982 concert by the Rolling Stones in West Berlin, Nena's guitarist Carlo Karges noticed that balloons were being released. As he watched them move toward the horizon, he noticed them shifting and changing shapes, where they looked like strange spacecraft (referred to in the German lyrics as a "UFO"). He thought about what might happen if they floated over the Berlin Wall to the Soviet sector. Also cited by the band was a newspaper article from the Las Vegas Review-Journal about five local high school students in 1973 who played a prank to simulate a UFO by launching 99 (one was lost from the original 100) aluminized Mylar balloons attached with ribbons to a traffic flare. The red flame from the flare reflected by the balloons gave the appearance of a large pulsating red object floating over Red Rock Canyon outside the Las Vegas Valley in Nevada. A direct translation of the title is sometimes given as "Ninety-Nine Air Balloons", but the song became known in English as "Ninety-Nine Red Balloons". The title "99 Red Balloons" almost scans correctly with the syllables falling in the right places within the rhythm of the first line of lyrics, although Neunundneunzig (99) has one syllable more than "ninety-nine". The lyrics of the original German version tell a story: 99 balloons set free by a couple of friends are mistaken for UFOs, causing a general to send pilots to investigate. Finding nothing but children's balloons, the pilots decide to put on a show and shoot them down. The display of force worries the nations along the borders and the defense ministers on each side bang the drums of conflict to grab power for themselves. In the end, a 99-year war results from the otherwise harmless flight of balloons, causing devastation on all sides without a victor. At the end, the singer walks through the devastated ruins with a balloon. Thinking of someone, they let it loose and watch it fly away. The English version retains the spirit of the original narrative, but many of the lyrics are translated poetically rather than directly translated: red helium balloons are casually released by the civilian singer (narrator) with her unnamed friend into the sky and are registered as missiles by a faulty early warning system; the balloons are mistaken for military aircraft which results in panic and eventually nuclear war, with the end of the song near-identical to the end of the original German version. There have been two re-recordings of the original German version of the song that have been released by Nena: a modern version in 2002, which was included on Nena feat. Nena (2002), and a retro version in 2009, which included some verses in French. Live recordings of the song are included on all seven of Nena's live albums, dating from 1995 to 2018. A special edit that combined the English and German versions of the song was played on American Top 40 with Casey Kasem for the week of 24 March 1984 (Program #814-12). A version of this song with Spanish lyrics, Mi Globo Azul (English: 'My Blue Balloon'), was recorded by the Mexican band, Timbiriche in 1985. American and Australian audiences preferred the original German version, which became a very successful non-English-language song, topping charts in both countries, reaching No. 1 on the Cash Box chart, Kent Music Report, and No. 2 on the Billboard Hot 100, behind "Jump" by Van Halen. It was certified Gold by the RIAA. The later-released English translation, "99 Red Balloons", topped the charts in the UK, Canada and Ireland. In his 2010 book Music: What Happened?, critic and musician Scott Miller declared that the song possesses "one of the best hooks of the eighties" and listed it among his top song picks for 1984. Nonetheless, he cautioned: "It must be admitted that this song suffers from an embarrassingly out-of-place disco funk interlude, and the word kriegsminister." The promotional video, which was originally made for the Dutch music programme TopPop and broadcast on 13 March 1983, was shot in a Dutch military training camp, the band performing the song on a stage in front of a backdrop of fires and explosions provided by the Dutch Army. Towards the end of the video, the band are seen taking cover and abandoning the stage, which was unplanned and genuine since they believed the explosive blasts were getting out of control. VH1 Classic, an American cable television station, ran a charity event for Hurricane Katrina relief in 2006. Viewers who made donations were allowed to choose which music videos the station would play. One viewer donated $35,000 for the right to program an entire hour and requested continuous play of "99 Luftballons" and "99 Red Balloons" videos. The station broadcast the videos as requested from 2:00 to 3:00 pm EST on 26 March 2006. Stanislav Petrov, a Soviet early-warning system operator who in 1983 disregarded a false nuclear attack alarm (from shining clouds, rather than balloons) and may have prevented a nuclear war. ^ "99 Red Balloons – interview with the writer, Kevin McAlea". Eighty-eightynine. Retrieved 17 July 2014. ^ "Strange flying object sighted over Red Rock". Las Vegas Review-Journal. 9 September 1973. ^ a b "99 Luftballons, Side by Side Comparison". In the 80s. Retrieved 29 October 2014. ^ "A very good group from Germany". No.1. 17 March 1984. p. 38. ^ Strike, Andy (10 March 1984). "99 Red Herrings". Record Mirror. p. 14. ^ "Nena tours and setlists". Nena.de. Retrieved 10 June 2015. ^ "Nena feat. Nena – 20 Jahre by Nena". iTunes DE. Apple Inc. Retrieved 27 June 2013. ^ "99 Luftballons – Single by Nena". iTunes US. Apple Inc. Retrieved 27 June 2013. ^ "99 Luftballons". Nena.de. Retrieved 8 March 2016. ^ "Live at SO36". Nena.de. Retrieved 8 March 2016. ^ "Nichts Versäumt Live". Nena.de. Retrieved 9 November 2018. ^ Battistini, Pete (2010). American Top 40 with Casey Kasem (the 1980s). AuthorHouse. p. 224. ISBN 978-1-45205-038-6. ^ "March 3, 1984 – The Hot 100". Billboard. 3 March 1984. Retrieved 17 July 2014. ^ a b "Top RPM Singles: Issue 4454." RPM. Library and Archives Canada. Retrieved 6 July 2011. ^ a b "The Irish Charts – Search Results – Nena". Irish Singles Chart. Retrieved 6 July 2011. ^ a b "Official Singles Chart Top 100". Official Charts Company. Retrieved 17 July 2014. ^ Miller, Scott (2010). Music: What Happened?. Alameda, CA: 125 Books. p. 120. ISBN 978-0-61538-196-1. ^ Brendel, Rolf (2014). Nena – Geschichte einer Band. Berlin: Aufbau Verlag GmbH & Co. pp. 131–5. ISBN 978-3-35105-015-3. ^ "VH1 Classic to Air the Classic 80s Music Video '99 Luftballons' for an Entire Hour on Sunday, 26 March" (Press release). VH1 Classic. PR Newswire. 22 March 2006. Retrieved 28 March 2014. ^ "VH1 Classic to air '99 Red Balloons' music video for a full hour". USA Today. Associated Press. 24 March 2006. Retrieved 11 October 2017. ^ "Australia No. 1 hits -- 1980's". World Charts. Archived from the original on 9 January 2017. ^ "Austriancharts.at – Nena – 99 Luftballons" (in German). Ö3 Austria Top 40. Retrieved 4 June 2013. ^ "Ultratop.be – Nena – 99 Luftballons" (in Dutch). Ultratop 50. Retrieved 4 June 2013. ^ "MusicSeek.info – UK, Eurochart, Billboard & Cashbox No.1 Hits". MusicSeek.info. Archived from the original on 14 June 2006. ^ a b "Japan #1 IMPORT DISKS by Oricon Hot Singles". Hbr3.sakura.ne.jp. Retrieved 17 July 2014. ^ "Nederlandse Top 40 – week 13, 1983" (in Dutch). Dutch Top 40 Retrieved 4 June 2013. ^ "Dutchcharts.nl – Nena – 99 Luftballons" (in Dutch). Single Top 100. Retrieved 17 July 2014. ^ "Charts.nz – Nena – 99 Luftballons". Top 40 Singles. Retrieved 4 June 2013. ^ "Norwegiancharts.com – Nena – 99 Luftballons". VG-lista. Retrieved 4 June 2013. ^ Salaverri, Fernando (September 2005). Sólo éxitos: año a año, 1959–2002 (in Spanish) (1st ed.). Spain: Fundación Autor-SGAE. ISBN 84-8048-639-2. ^ "99 LUFTBALLONS – Nena" (in Polish). LP3. Retrieved 22 December 2014. ^ "Swedishcharts.com – Nena – 99 Luftballons". Singles Top 100. Retrieved 4 June 2013. ^ "Swisscharts.com – Nena – 99 Luftballons". Swiss Singles Chart. Retrieved 4 June 2013. ^ "Nena Chart History (Hot 100)". Billboard. Retrieved 4 June 2013. ^ "Nena – Awards". AllMusic. Archived from the original on 28 May 2016. ^ "CASH BOX Top 100 Singles – Week ending MARCH 10, 1984". Cash Box. Archived from the original on 30 September 2012. ^ "Offiziellecharts.de – Nena – 99 Luftballons". GfK Entertainment Charts. Retrieved 4 June 2013. ^ "Jahreshitparade 1983" (in German). Austriancharts.at. Hung Medien. Retrieved 17 July 2014. ^ "Jaaroverzichten 1983" (in Dutch). Ultratop. Hung Medien. Retrieved 17 July 2014. ^ (in German) "Jahrescharts – 1983". Cash Box. Archived from the original on 9 May 2015. ^ "Top 100-Jaaroverzicht van 1983" (in Dutch). Dutch Top 40. Retrieved 17 July 2014. ^ "Jaaroverzichten – Single 1983" (in Dutch). Single Top 100. Hung Medien. Retrieved 17 July 2014. ^ "Schweizer Jahreshitparade 1983" (in German). Hitparade.ch. Hung Medien. Retrieved 17 July 2014. ^ "Forum – ARIA Charts: Special Occasion Charts – Top 100 End of Year AMR Charts – 1980s". Australian-charts.com. Hung Medien. Archived from the original on 6 October 2014. ^ "TOP – 1984" (in French). Top-france.fr. Retrieved 17 July 2014. ^ "Top 100 Hits for 1984". The Longbored Surfer. Retrieved 17 July 2014. ^ "The CASH BOX Year-End Charts: 1984". Cash Box. Archived from the original on 30 September 2012. ^ "Les Singles / Titres Certifiés "Or"" (in French). InfoDisc. Retrieved 17 July 2014. ^ "Les Meilleures Ventes "Tout Temps" de 45 T. / Singles / Téléchargement" (in French). InfoDisc. Retrieved 13 May 2016. ^ "Gold-/Platin-Datenbank (Nena; '99 Luftballons')" (in German). Bundesverband Musikindustrie. ^ "American single certifications – Nena – 99 Luft Ballons". Recording Industry Association of America. If necessary, click Advanced, then click Format, then select Single, then click SEARCH. ^ "South African Rock Lists Website SA Charts 1969 – 1989 Acts (N)". Rock.co.za. Retrieved 21 June 2013. ^ "Top 100 Singles of 1984". RPM. Vol. 41 no. 17. 5 January 1985. Retrieved 17 July 2014. ^ "Canadian single certifications – Nena – 99 Red Balloons". Music Canada. 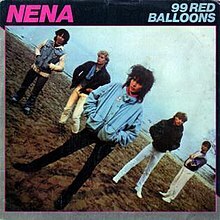 ^ "British single certifications – Nena – 99 Red Balloons". British Phonographic Industry. Select singles in the Format field. Select Gold in the Certification field. Type 99 Red Balloons in the "Search BPI Awards" field and then press Enter. ^ "[2002&cat=s Ultratop.be – Nena – 99 Luftballons "] (in Dutch). Ultratip. Retrieved 4 June 2013. ^ "[2002&cat=s Swisscharts.com – Nena – 99 Luftballons "]. Swiss Singles Chart. Retrieved 4 June 2013. "Willst du mit mir gehn"
This page was last edited on 16 April 2019, at 02:52 (UTC).